As part of the series about China, please find 8 key facts about China mobile e-commerce below. Data is from eMarketer. I have the presentation here in pdf and on slideshare as well. Feel free to use/share. If you use the materials from the presentation, please help to quote the source. 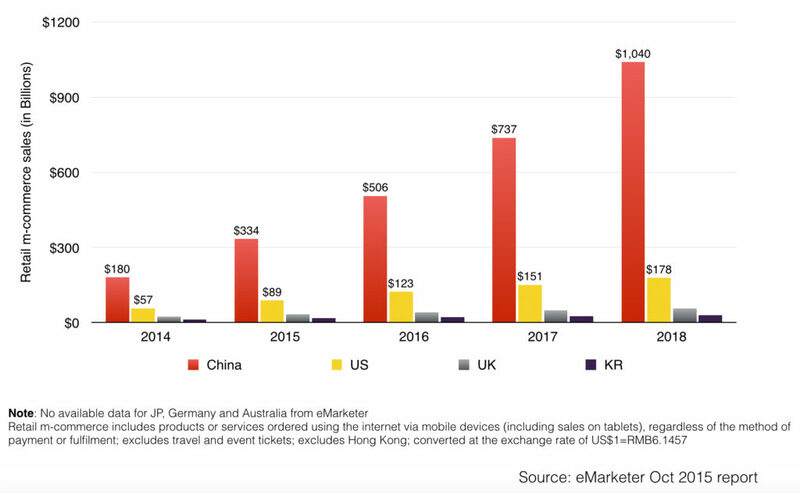 As you could see from the graph above, China retail m-commerce (excluding travel and event tickets) is larger than those of the US, UK and KR combined and it’s growing rapidly. According to eMarketer, in 2015, China mobile e-commerce was about 50% of the total retail e-commerce sales and about 8% of total retail sales. This is huge. 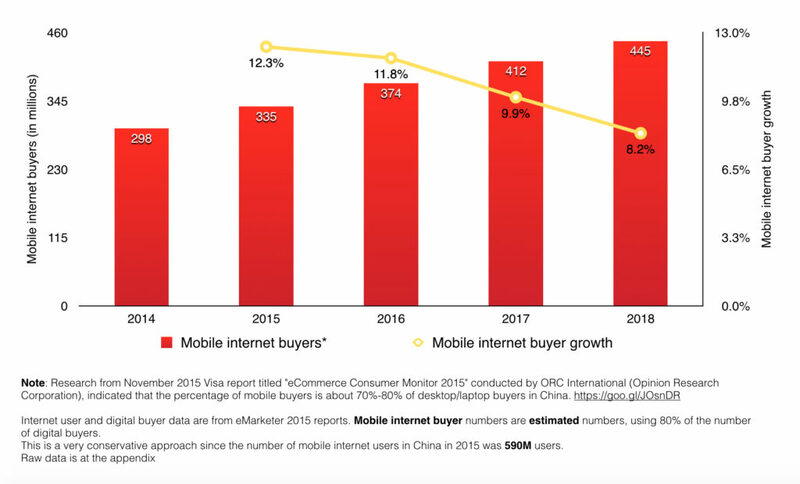 As you may notice in the note section in the graph above, the number of mobile internet buyer in China is an estimated numbers based on internet user, digital buyer number and the percentage of mobile buyer data from different eMarketer report / Visa Nov 2015 report titled “e-commerce Consumer Monitor 2015”. This is an important fact. 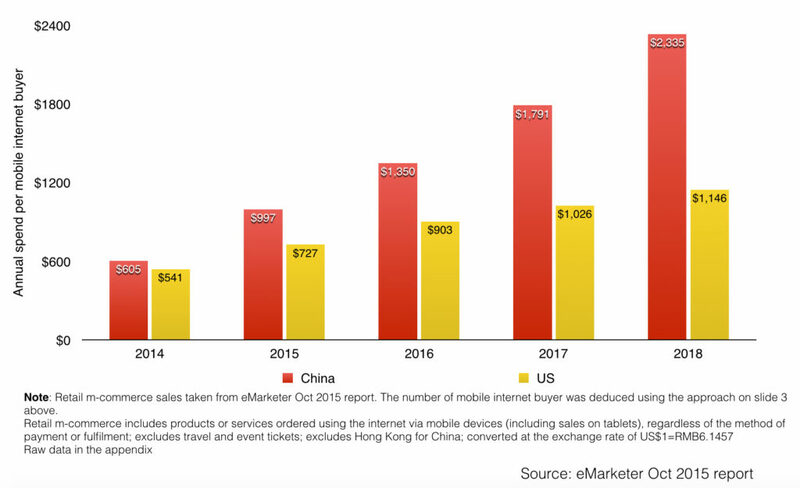 Not only that we have more mobile internet buyers in China vs the US (2.7X more), each mobile buyer in China also spends more than their US counterpart (about 37% more) on average. 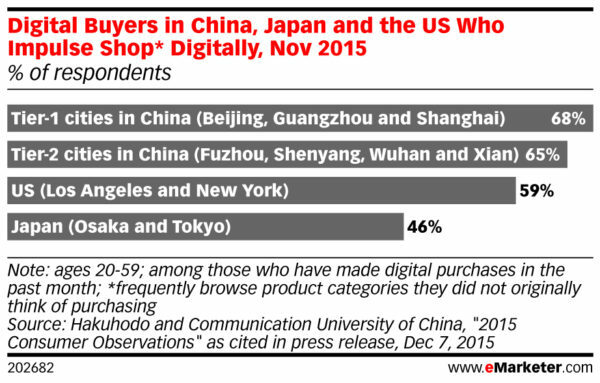 This makes mobile commerce in China an essential part of many companies. As you could see from the chart above, while the majority of household income of digital buyers in China is between $650 – $1000, about 13% of digital buyers in China has household income of more than $1800/month. If you multiply this with the total number of digital buyers in China in 2015 (418.7M), you would have an audience of 54.4M digital buyers, whose household income is more than $1800/month or $22k/year. This is a large enough audience for many brands. 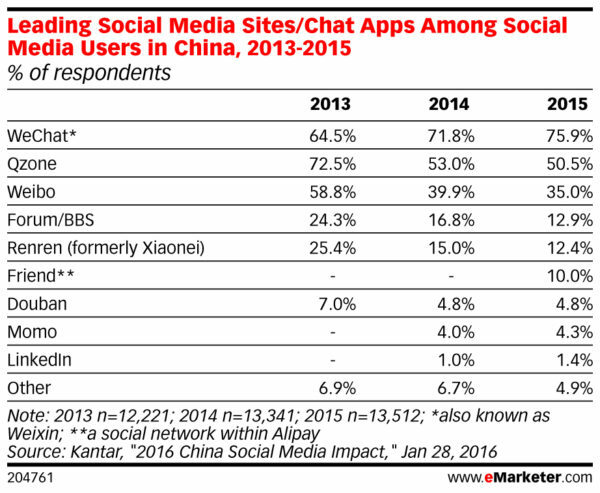 In other words, using WeChat alone, we could reach the majority of all digital buyers in China, especially on Mobile since WeChat is a mobile platform. 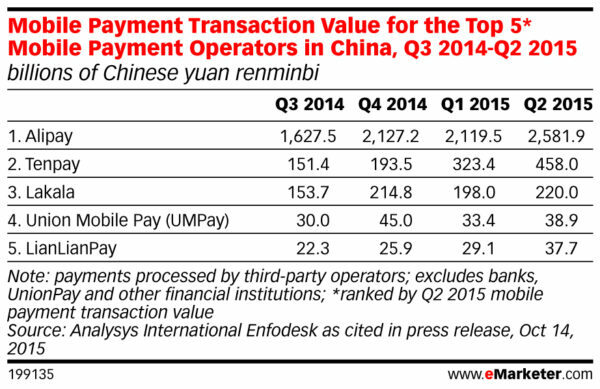 Alipay and Tenpay seem to be the two clear leaders so far. 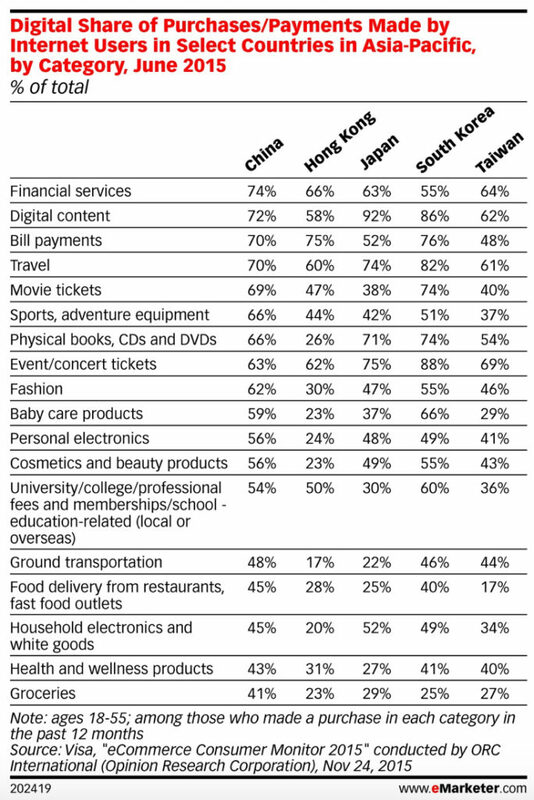 In addition, as you could see from the graph above, digital buyers in China are willing to buy a variety of items online, anything from groceries, food delivery to digital content, movie tickets etc… They are getting more and more advance quite quickly. Data is from the December 2015 Hakuhodo and Communication University of China report titled “2015 Consumer Observations” as cited in press release. 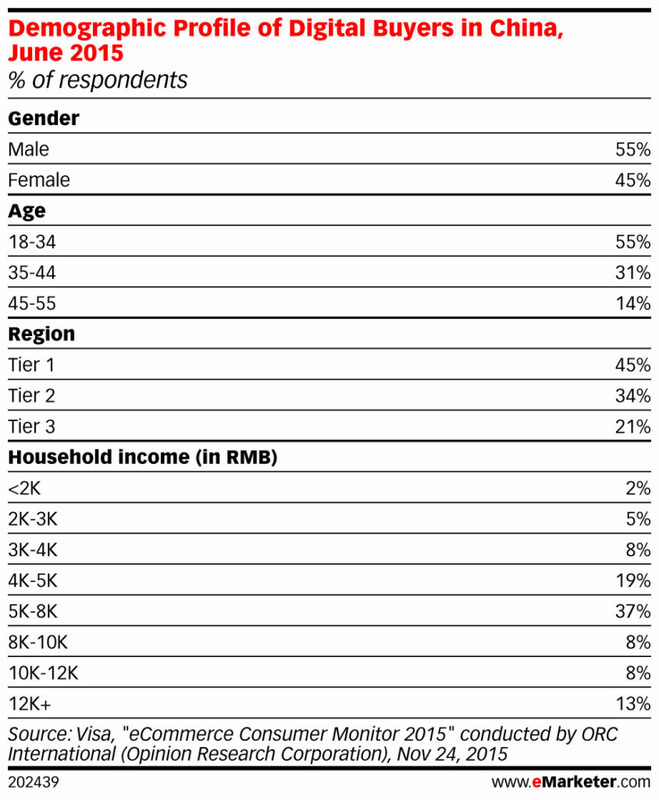 3,520 consumers ages 20-59 living across tier 1-3 cities in China were surveyed during November 16-19, 2015. Among the respondents in China, 960 had a monthly household income of 7,000+ Chinese yuan renminbi and were from tier-1 cities (Beijing, Guangzhou, Shanghai), 1,280 had a monthly household income of 5,000+ Chinese yuan renminbi and were from tier-2 cities (Fuzhou, Shenyang, Wuhan, Xian) and 1,280 had a monthly household income of 4,000+ Chinese yuan renminbi and were from tier-3 cities (Shantou, Xiangyang, Xuzhou, Zhangjiakou). Again if you need to download the presentation in pdf format, you could try pdf or on slideshare.